According to Folks Huxford, Samuel Register came from Appling County to Lowndes County, GA about 1826 and settled in the 10th Land District near Possum Branch, not too far from the homestead of Levi J. Knight and the future site of Ray City, GA. Samuel Register’s place later became the farm of Jesse Shelby “Dock” Shaw. Samuel Register was born in Sampson County, North Carolina on December 1, 1786, almost three years before that state would ratify the U.S. Constitution. He was a son of Dorcas and John Register. Some time before 1804 Samuel Register came with his family to Bulloch County, GA where he apparently made his home for some 20 years, although there is no records to show that he ever owned land there. In April of 1806 he married Elizabeth Skinner, a native of South Carolina. When the U.S. went to war with Britain from 1812-1815 in response to British actions against American expansion and trade, it appears that Samuel Register, like other Wiregrass pioneers (see Dryden Newbern) joined the Georgia Militia. In the War of 1812 the Georgia Militia was occupied with three main theaters of operation: the Creek War of 1813-14, the British blockade, and the British occupation of St. Marys and Cumberland Island in 1814-15. British control of St. Marys, GA would have disturbed the economy of the entire Wiregrass region, interrupting trade on the Alachua Trail which ran from the Altamaha River through Centerville, GA, then across the St. Marys River and into East Florida. The resistance of the Georgia Militia against the British incursions is described in the New Georgia Encyclopedia article on the War of 1812. After the War of 1812, Samuel and Elizabeth remained in Bulloch county. GA until about 1824 when they moved to Appling County, and then on to Lowndes county in 1826. In 1827, Samuel Register received a draw in the land lotteries for his service as a soldier in the War of 1812. The land lotteries, legitimized by questionable and coercive treaties, continued the encroachment by settlers on the ancestral lands of Native Americans in Georgia, inevitably leading to conflict. In Florida, hostilities were greatly escalated in December 1835 by the Dade Massacre, where Seminole Indians resisting forced removal to the West wiped out a force of 110 regular army troops under the command of Major Francis Langhorn Dade. When conflict between the Wiregrass pioneers and the resistant Indians erupted in 1836, local militia fought engagements in Berrien county. In the summer of 1836, a company of militia under Capt. Levi J. Knight of near Ray City was sent to protect the settlers from marauding Indians on their way to join the Seminoles in Florida. When a party of Indians plundered the plantation of William Parker, near Milltown, the militia pursued them N. E. across the county overtaking them near Gaskins Pond not far from the Alapaha River. Several were killed and some injured as the Indians fled across the river. A few days later the militia encountered more Indians at Brushy Creek and ran them off. That was the last real battle with the Indians in this section. Across the state line in Florida, actions against Indians were being fought by militia on a regular basis. The Battle of San Felasco Hammock was fought September 18, 1836, when a force of 25 US Army Regulars and 100 horse-mounted militia from Fort Gilleland, with 25 armed residents of Newnansville, FL engaged and routed about 300 Indians led by Seminole Chief John Jumper. Fort Gilleland, a picketed fortification located south of the Santa Fe River at Newnansville in present day Alachua County, FL, was one of a string of forts stretching from Jacksonville, FL to Clay’s Landing, at the mouth of the Suwanee River. Newnansville, the largest inland town in East Florida, was strategically located at the junction of the Jacksonville road and the Bellamy Road which ran from St. Augustine west to Tallahassee and Pensacola. Newnansville was about about 80 miles southeast of Troupville, in Lowndes County, GA.
—Extract of a letter from Col. Mills, to the Editor, dated Fort Gilliland, May 8. The following summer, in 1837, Samuel Register and other Lowndes county men went south to join the East Florida Volunteer militia to fight against the Indians on the Florida frontier. 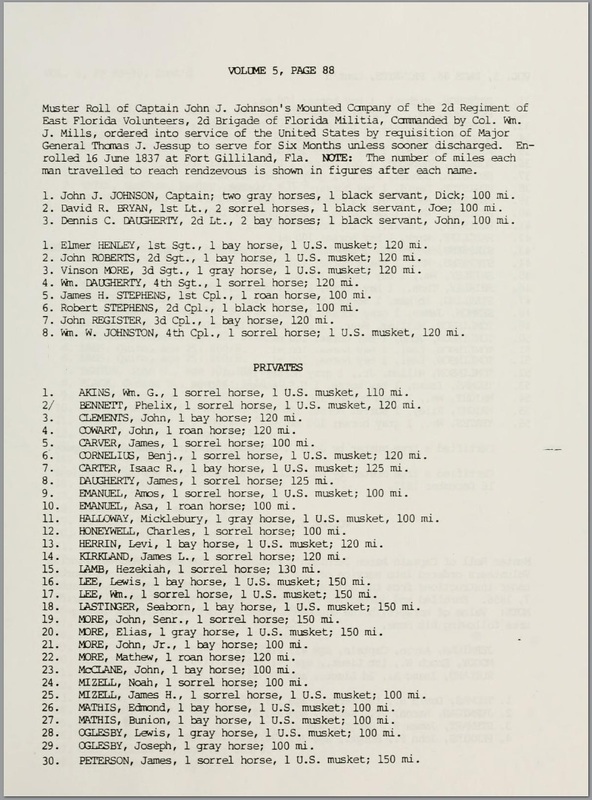 According to the records of the Florida Department of Military Affairs, Register traveled first to Fort Palmetto, on the Suwanee River at Fanning Springs, FL. 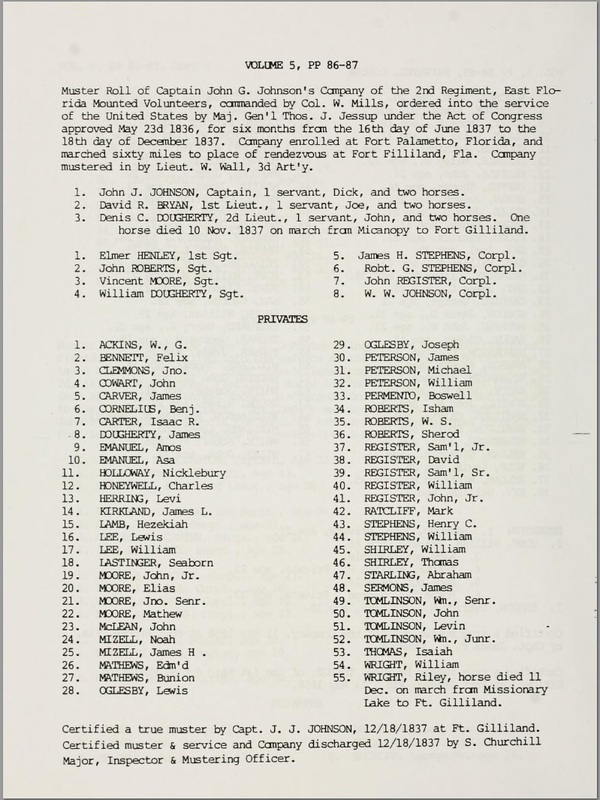 His son-in-law, John Tomlinson, and two other Registers in this same service and company: Samuel Register Jr and John Register, Jr.. Seaborn Lastinger, of Lowndes County, served as a private; he would be shot for desertion during the Civil War. James B. Johnson and Young Johnson , grand uncles of JHP Johnson of Ray City, served in the Florida Drafted Mounted Militia. 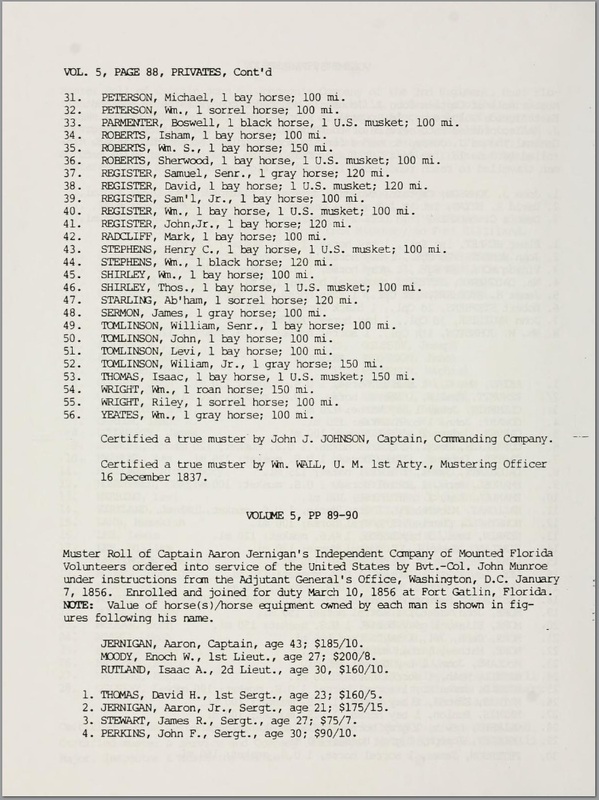 Muster Roll of Captain John J. Johnson’s Mounted Company of the 2d Regiment of East Florida Volunteers, 2d Brigade of Florida Militia, Commanded by Colonel William J. Mills. Between 1840 and 1842, Samuel Register sold out his home-place in the 10th District, and moved from Possum Branch to the 11th Land District where he acquired Land Lot 500. This lot was in that part of Lowndes county that was cut into the new county of Clinch in 1850, and in 1920 was cut out of Clinch into Lanier County. In 1856, it was a great boon to Register when the Atlantic & Gulf railroad was charted to run from a connection with the Savannah, Albany & Gulf railroad at Screven, by way of his land to Thomasville. But when the surveyors for the new railroad selected a route through Valdosta bypassing Troupville, that old town was doomed. Register had a portion of Lot 500 platted into town lots and founded the town of “Registerville.” Although when the railroad people came through, they changed the name to “Stockton”, in honor of one of their contractors, a Mr. Stockton, who had charge of the road construction. Zilpha Register, born Feb. 4, 1807, married her first cousin John Tomlinson. Eady (Edith) Register, born Mar. 1, 1809, married Thomas Mathis Nov. 1, 1826 in Lowndes County. Guilford Register, born Jan. 7, 1811, married Priscilla Ann DeVane. David Register, born Apr. 10, 1813, married Matilda McDaniel of Bulloch County. William Register, born Sept. 24, 1814, married Luraney Harnage from Liberty County. John Register, born June 10, 1819, married 1st Elizabeth Cowart, 2nd.Mary Ann Fiveash. Rebecca Register, born Apr. 5, 1821, married Reverend Hillery Cowart of Echols County. Phoebe Register, born Aug. 15, 1823, married Zachariah Lee of Clinch County. Jincy Register, born June 15, 1824, married Moses C. Lee of Berrien County. Samuel E. Register, born Sept. 16, 1826, married 1st Seneth Lee, married 2nd Mary Hutto, married 3rd Josephine Guthrie, lived in Berrien County. Elizabeth Register, born Aug. 21, 1828, married William Patten of present Lanier County. Reubin Register, born Nov. 25, 1830, married Harriet Brown, lived in present Berrien co.
Martha Register, born Dec. 18, 1831, married Hillery P. Mathis of present Lanier co.